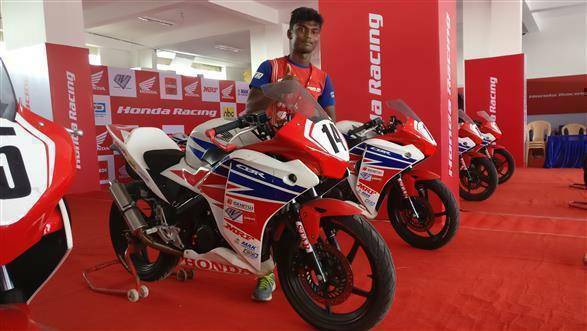 Sixteen-year-old Senthil Kumar rides a bicycle around on most days, except when he is trading grid positions with seasoned racers in the 2017 MRF MMSC FMSCI Indian National Motorcycle Racing Championship. Within two years, the Coimbatore lad has quickly climbed the leaderboard in the Honda One Make Championship. He stood fourth in the points tally as the racing began on Saturday at Round 4 of the championship, before a collision meant he could not finish the day's race and slipped down to seventh position. However, given that he has only been racing for two years, Senthil is aiming high. The youngest participant in INMRC says his goal is to race in premier-class international motorsport events before he turns 23. "I am constantly learning. I study the styles of senior racers in the circuit and also observe the moves of international racers in the Moto3 and other championships. This helps me decide when to make my move against any competitor. Us younger boys have lesser fear while attacking on a racetrack. This gives us an edge over the older participants, who in turn have experience in their favour. Growing with each race, I intend to race in the Moto3 class of MotoGP before I turn 23," the class XI student tells OVERDRIVE. A lofty goal. 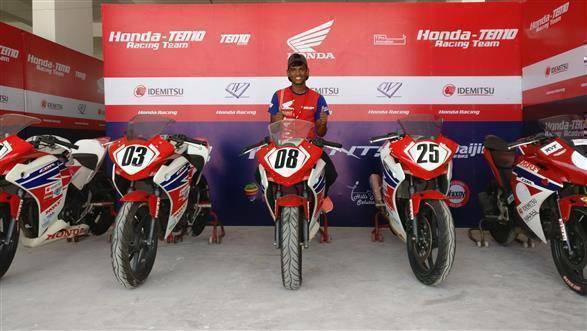 Apart from the Honda One Make Championship, Senthil also competes in the Stock (up to 165cc) class on his Honda Ten10 Racing CBR150R. A far-fetched dream? Not at all, says Prabhu Nagaraj, VP of customer experience at Honda Motorcycles and Scooters India (HMSI). "We saw the talent in Senthil early on and asked him to race for us. He is being trained to compete at the international level. He may represent us at the Asia-level soon, and move up to Moto3 races in coming years," he said. "With motorcycle racing turning into a good career option, and more platforms emerging in India, it is only a matter of time before young winning racers emerge from the country. There is no dearth of talent and we are increasingly finding racers aged under 20 years now, a big change from just 5 years ago," Nagaraj added. After Saturday's race, Rajiv Sethu is the prime example of young talent. Finishing second in the Super Sport Indian (up to 165cc) class, the 18-year-old Honda Ten10 Racing rider is steadily maintaining his position at the top of the leaderboard this season. Since this year, he already represents the team at the Asian Road Racing Championship (ARRC) in the AP250 class, and will also be participating in the upcoming Thai Talent Cup astride a Honda NSF250. Since his racing career began in 2014, the youngster has already dealt with two major crashes including one at 185 kmph. He has already had to recover from severe injuries to the leg and hip. "This is what separates us younger lot. We are ready for more risks, and we are more active on and off the track. I spend six hours a day training when I am not racing. My bosses at Honda Ten10 as well as my mentor Sarath Kumar motivate me every day to push harder and become better. We youngsters are also more open to learning new things. With age on my side, I have time to raise my talent to compete in Moto3 or even Moto2 class in the near future," said the ambitious teenager. Barely an adult, racing has taught Rajiv to be surprisingly aware of safety norms. "I have a driver's license and ride a Honda Dio outside of the racetrack. And not above 50kmph, given the way people drive on the streets. For anyone my age who thinks they are the bees-knees because they speed on the road, I'd just want to say come prove your talent on the track," he quipped.